I have to report to you about how this deep bite is all working. I know you did a nice job by posting my last details on this special "program" a few weeks ago and I appreciate it. 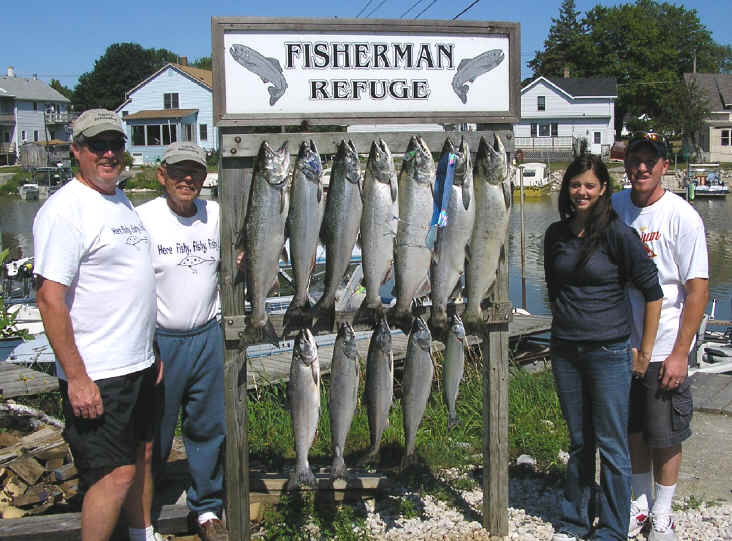 This year has been a struggle for Wisconsin fisherpersons on Lake Michigan . The June and early to mid July bite was barely 50% of what we were used to. The bait fish population explosion is no doubt part of this. "TV" screens are fill with a multitude of readings which equate to the best bait population in at least five years. In mid to late July, unseasonably warm weather and warm prevailing winds pumped up the surface temperatures higher than they had been for many years. Now that August is hear, water is PEE warm! I know much has been said for and against the Fish Hawk speed/temp device, but it has been a mainstay on our boat for 8 seasons and has helped us become better fishermen. Here is the "Dark Side" (Deep Side of the story): The last few weeks the probe has shown us that it has been 58 degrees or warmer at 120 feet down of cable length - this is with a 12# ball. What does that mean? From what we have been able to determine in nearly two decades is that BIG FISH and actually most fish do not want to come into this water. This is not to say they won't, just that they do not want to...and MOST OF THE FISH DO NOT. This condition has happened pretty much every year- but not for long, like this year. In any case, this occurs every year for part of the fishing season and also another condition exists almost every day of the year....SALMON DO NOT LIKE THE SUN LIGHT. Ok, you all know this - at least to some degree. What does this all mean - Well, it means that on most days, and in a great number of conditions, salmon are deeper than most people fish or better still, are deeper than most people can fish. I don't just mean that the depth of the water is deeper, just the fishing level is down lower. Point of reel fact. When I first really got clued into salmon fishing (8 - 10 years ago) versus brown trout or "the other fish" as we call it here, I know that hardly no one other than a few boats went out beyond 250 feet and that was for rainbows.....the amazing thing is that I and Terry's Toy, Sea Dog, Tuna, and Blue Rhino ended up at the same campground as these pioneers and have spent serious time "plumbing the depths" of some serious water. Now a days, many, many boats are out later in the day in 250 to 500 FOW. BUT they fish pretty much down no farther than 120 feet and most baiting is for rainbows. Sorry I digress........here is what I can tell you about fishing deep. Again, this is me, not necessarily Tuna, or Terry's Toy or Sea Dog or Blue Rhino, but I think I have it down as far as our experiences go. Fishing extra deep is like every thing else a matter of attitude. Most of the time we do not mark fish. We just fish at a depth of water or a depth down that no one else is. It happens after the time of day that no one else is catching anything. That is the time of the day to go hunting. The last weeks have been great and part of that was because we had two to three boats on a "search mission". The way that works, is Terry's Toy and Sea Dog (with Blue Rhino) and ourselves will take a different "chunk" of water. For instance Saturday August 5th at 8:30 am , we (3 P's) went out to 400 FOW, Sea Dog went to 330 FOW and Terry's Toy went to 280 FOW. We all ran two downriggers deep. One basically within 10 feet of the bottom and the other 50 to 80 feet above. The first boat to really contact fish (Terry's Toy at 240 FOW tight to bottom) called us in. Last weekend, was super ruff, but 3P's went out from 220 FOW to 320 and contacted fish at around 290 to 300 FOW - this was a mix of fish at 250 down and also tight to the bottom. All right, here is the program. For us, and don't get hung up on colors or what not.......the deeper you are, the more that blue is the color of choice. Hey this is what the folks tell us in all the fishing magazines....the color blue is what is visible - deeper. I want to tell you that I don't pay attention to fishing magazines....we just ran a lot of colors over the last few years (3P's has nearly 100 CJRF). BUT, at any rate, any dark will do. Fish confidently with any dark color flasher and meat rig you have. Tuna came up with an experimental flasher last year that did not pan out, but this year with the deep bite it has. Captain John was nice enough to sell us some blank dark green flasher blanks without any Witchcraft tape on them. On one side Tuna has the black version of the Mylar material you have, and the other 1/2 half glow and 1/2 half silver. Our thinking is you need a dark color or ? and the other side a lighter color or some sort of glow, not glow on both sides. I have a number of flies made out of material that you won't normally see, because a local store - Jerry's - in Algoma has been carrying this stuff, and I also have been making my own flies - which by my last count - I have over 50 "colors" of materials in bulk....bought in 25 or 50 yard lengths. As Tuna says - we have "stuff". Dark seems to be the answer....and by the way - this is on days when the sun is shining and the birds are singing and it is flat calm too. Last weekend was rougher than a cob here.....blue whacked the heck out of them, also. We had most of our fish during the 10 am to 2pm time slot when we had the water to ourselves. Reel fact. The Tri Color Dolphin has been our best bait for the three seasons we have fished over 220 feet down. Put some dark blue flies on it and it's a winner. This last weekend we had the blue on the second rigger at the same time, for the first time and both hit steady. This was the Blue Tail. Tuna had a purple meat rig on it and it stayed nearly as steady as our all time winner - the Tri Color Dolphin. Again, we don't like to be in a rut, so we mix up our "stuff", but dark baits seem to be the best. The only times we have had the Black Mamba with red meat rigs work on our boat is the deep bite.....Terry's Toy has had it working when John first got it out. Before I get into more details........we have not connected with super deep fish on rougher days that are cloudy and dark....more exploring to do in this area. 1) Use the heaviest cannonballs you or your downrigger want to wind up. One of our boats has problems with the circuit breaker tripping two or three times - each time it brings a 12# ball up. We use 17# balls when we fish over 200 feet of cable.....max is probably 240 feet for 12# and it will trail way back at trolling speeds. 2) Don't use mono for line. I hope that no one on this website uses mono for anything anymore other than leaders on bird rods or dipsey rods. Captain John has been nice enough to stock the 35# Cortland Spectron and it is worth running, no matter what. I run Spyder Wire Braided on my dipseys, and have longer than I am a member of this board, but I still stick with it as it has a smaller diameter, and we know from sticking baits in the bottom that it cuts deeper on a dipsey diver. May Captain John take pity on us and keep stocking the Cortland . 4) The release part is tricky. Sea Dog has experimented with different releases. Terry's Toy and 3P's have stuck with a Black's Release that is just above the ball. THESE RELEASES HAVE TO BE SET SO TIGHT AT THE BOAT , THAT YOU NEED A PLIERS TO POP THEM AS YOUR FINGERS WILL NOT PULL THEM OUT. This is necessary below 250 feet of cable or you will have nuisance trips which will have you guessing. 5) Keep the tension "tight" on the rod as you set up the release and as you send it into the murky depths. Too many times I have seen people lower cannonballs with a little slack line on a rod and have the line break at the release on a big fish bite. Most releases need to have tension on them to hold the twisted line in place until it is placed at the depth it needs to be at. I strongly recommend letting down 20 to 25 feet at a time and letting the bait "rest" for about 10 seconds or more....in other words, letting it down in "stages". 6) Set the flasher and meat rig out so it is at most 3 to 4 "passes" behind the ball. There are strange unknown currents down there. We think, that no matter how bright out it is, it is still pretty dark down there and the proximity helps the fish locate the bait using the noise from the ball. They sense primarily with their lateral line in the dark. 7) Most importantly - when you have a bite.....or the rod does funky things - DO NOT TAKE IT OUT OF THE ROD HOLDER - Yes leave it in and just reel as fast as possible. Remember, you have the worlds longest line bowed out and down to the rigger and then back to the bait. Keep reeling until the fish is fighting so hard on the rod that you can barely get the rod out of the holder - NOW pull it out and continue to fight the fish. Oh yeah, I hate to spill the beans, but if you do this on a lead core line (we run up to 20 colors) your hooking percentage will be nearly 100%. This method is an ugly way to fish, but you will catch fish consistently. Here is the biggest tip. When you have a bite or a release, the tip of the rod usually pops up - well this is the slack deal that has to be made up. Wind as fast as you can and as long as you can. Many fish are flying up to the top or heading back to the boat and you are trying not to give them slack. 8) OK, I have one more super important note. Make sure all your hooks are not just sharp, but sticky sharp. Someone on this site pointed out just a week ago or so...you know who you are........your hooks should not just scratch your thumbnail or fingernail. When sharpened properly they should "stick" to your nail and pretty much prevent you from dragging across the nail. Its hard enough to set a hook at a fish that is 80 to 100 feet down when you have the line bowed back, but even harder to do so with 2 or 3 times as much line out. 9) Darn, one more tip……..two downrigger rods are way more than you want at these depths, especially if you need to turn and “run” out of the way of a large freighter that is chasing up in the shipping channels that are way out there. There are more details that I am sure we can let you know about later, as this is just some basics we figured out so far. Actually, so far we have barely scratched the surface of this water and are still learning - the hard way - sometimes. Let the rest of the readers know about your learning experiences for this deep bite. You may actually not need to use these tips this year, but you may in the near future.